Your choice of design is placed above your wording on this rustic seal and send wedding invitation featuring a wood grain background. 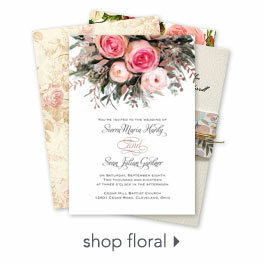 Choose from hundreds of designs to truly create a unique wedding invitation. Click on the "personalize" button to see all of the designs to make this a one of a kind event. Design options include love quotes - such as True Love Forever, Love Never Fails, All You Need Is Love, This Day I Will Marry My Friends, Happily Ever After, Religious Phrases...and many more phrases. Designs available to fit almost any theme you can imagine including hearts, destination, beach, cruise, Las Vegas, bikes, lovebirds, owls, nautical, flowers, Paris theme, country, seasonal autumn, winter snowflakes, floral, butterfly, masquerade, castles, musical notes, sports themes and more! Your wording is printed in your choice of colors and fonts. The invitation features a perforated response card printed with your return address on one side and your response wording on the other. Guests fill out the card, remove it and return it to you (be sure to place a stamp on the card for guests' convenience). The price includes printing your wording inside and your return address on the outside flap. I wanted a simple invitation for guest to have all the information on 1 page and 1 response card without purchasing separate items. Seal and Send invitations are the best!!!! The price of a seal and send invites cost less than the price to purchase separate items for accommodations, response cards, transportation info, etc. And your guests will appreciate the send and seal invitations with stamps (that you provide) already placed for them!!! So simple! The customer service staff is very responsive and helpful as well. I had to make changes to my first set of invitations and the customer service agent helped me instantly! They are super quick with shipping your item. I placed the order on a Thursday and received it on Tuesday! I was super shocked! I was so impressed by this compnay's service, designs, and shipping that I purchased our programs from here too. Our guests loved it!!! Thank you thank you! Thank you for the discount codes as well! I used all of them for every purchase!! I had been eyeing these invites up for awhile and finally bit the bullet when there was a sale. These literally shipped the next day and I got them the day after. Love how simple they are. Only thing I'd point out is the paper is actually a lot lighter than the picture looked, but I like it so I can use any pen for writing addresses! So happy I found this site and it's reasonable prices and quality! I was very happy with the results and so is my fiance.. And that says alot. They are so us!! It can be nerve racking ordering something online that you can't really see or feel but these invitations exceeded my expectations of quality. Very cool design and we are saving money on stamps due to being able to use post card stamps for the return! Simple and effective. Paper is very good weight, use a quarter to make the folds clean and crisp. These are perfect for me. I am very laid back and these invitations show my laid back nature and they are simple and no one has to fiddle with tons of envelopes. I absolutely loved our invitations. They were easy to put together PLUS they are cheaper to mail and the RSVP's were cheaper to mail as well. We only had to pay for a postcard stamp for the RSVP's which were $.32/stamp instead of $.49/stamp. They were shipped in just a few days. Everything was very easy. The choices for the graphic were nice. We are going with a country theme and I had many graphics to choose from for the invitation. I also liked the text color choices and the different fonts. Since I used the invitation for the shower rather than the actual wedding, I used the perforated section to list the registry information on one side and the event information on the other. 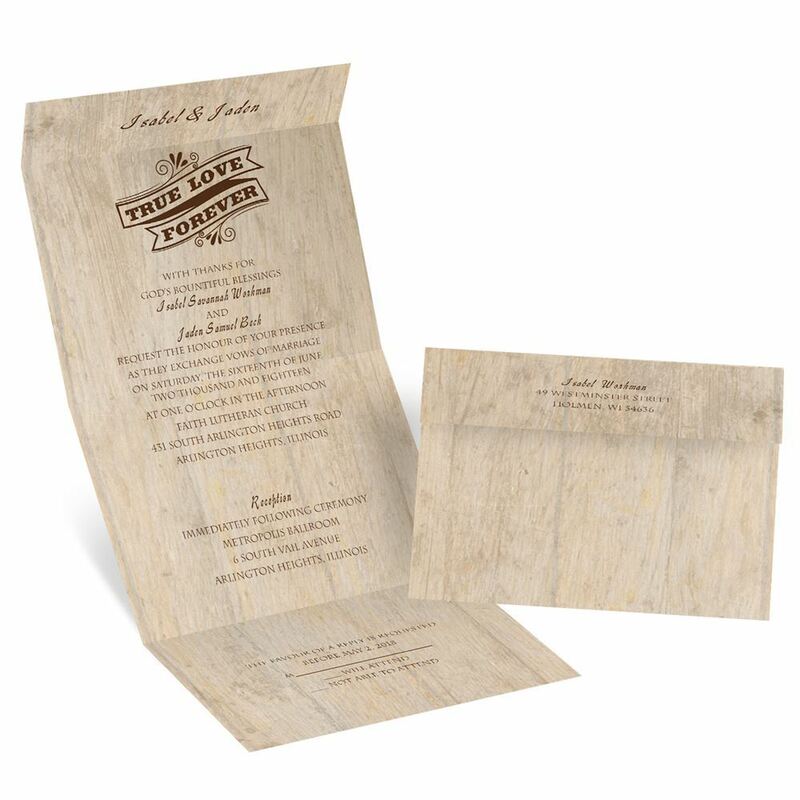 This allows the guests to simply detach at the perforation and carry a small card with the needed information. Since you do not need an envelope that is one less step to assembling the invitation. However, I did notice that the invites got a little roughed up in the mail. The paper quality was adequate so I was surprised by this. All in all I was very pleased with the product and have received many compliments. I ordered wedding invitations and I love them! They turned out better than I expected and were very affordable! Delivery was fast and me shipping was free! You can't really beat that!! I liked that it was easy to order and put all the information in. It gave you suggestions but were also able to put in your own wording. My order arrived fast. Loved having everything in one. At least there was one aspect of the wedding planning I was able to simplify. Great company to work with, very helpful and easy to work with. Just what we dreamed of! We bought these invitations for our wedding! They are everything we wanted and more! The quality is excellent and very easy to put together and ship! I loved how we could customize everything, every little line! I loved everything about them!! I love them! They fit the rustic theme of my wedding perfectly! Super fast delivery, super impressed! Love the simple design if the tri-fold. It made this SO easy!! !